Last week on a quiet Sunday afternoon spent lounging in the sun, I read Stephanie Alexander’s book Cooking and Traveling in South-West France. It is a beautiful book with stories of the people she met and the meals they shared. 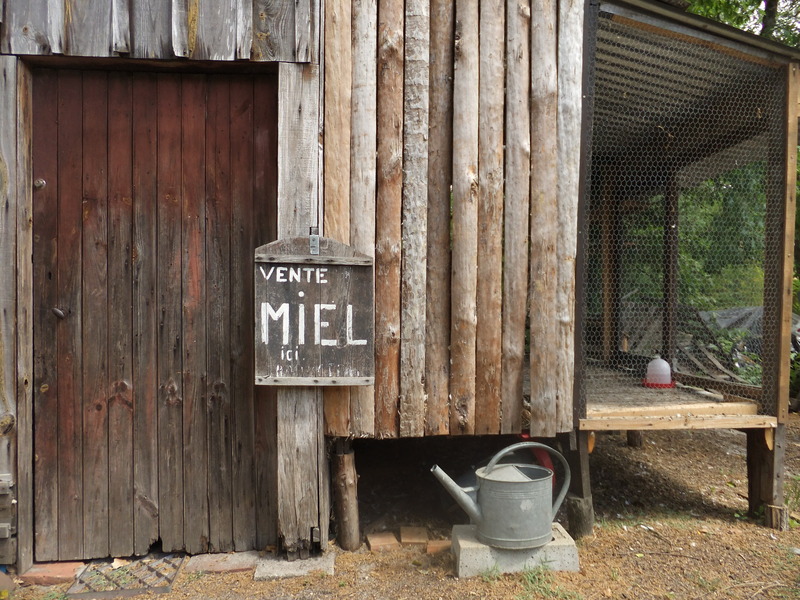 The south-west is quite possibly my favourite region of France with its rich culinary history and wine culture. I enjoy Stephanie’s book in a somewhat bittersweet way: during my few days in Bordeaux I was as poor as a church mouse and surviving on a few yoghurts, a few apples and a pottle of couscous salad, eating a few teaspoons every few hours to tide me over. It is these experiences of the poor starving backpacker that made me so appreciative of the meals I shared with my french friends. One particular meal with my friend Sophie and her family we had an entrée of a salad with mesclun, foie gras, magret de canard, corn and small preserved onions that were so tiny and so sweet I thought they might have been a berry. It is a surprisingly light salad, and a reminder that salad is so much more than torn lettuce with a chopped tomato or cucumber. It was not until I read the page titled La Salade Composée in Stephanie Alexander’s book that I remembered this meal and this salad, the delicate flavours of the duck enhanced by the simple preparation. Stephanie writes that a ‘composed salad’ can be made with any number of ingredient combinations, though it pays not to overcrowd the flavours too much. La salade composée reminded me of another salad, our Saturday lunch sort of salad, in winter or summer: chicken, pear, walnut and blue cheese. 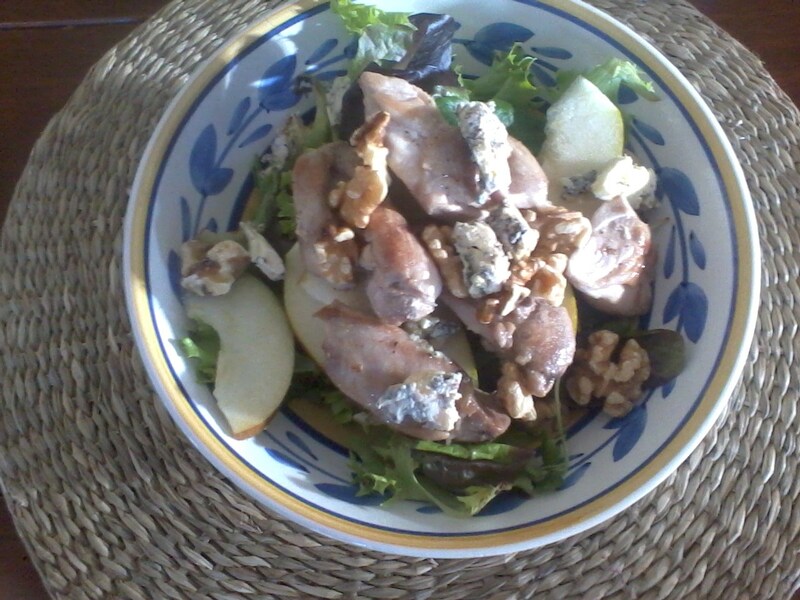 Slices of fragrant, slightly firm pear, crumbles of blue cheese, lightly toasted walnuts and pan-grilled chicken is a classic combination, and, like the duck and foie gras salad, the marriage of flavours is perfectly balanced by the freshness of mesclun, or baby rocket, or cos lettuce. Serve with grilled bread, drizzled in olive oil. I was given a few bottles of beer which I thought would make for better cooking projects than for drinking. I made a beef, tomato and beer casserole in the crockpot which simmered away all afternoon. I used another bottle of beer to make beer bread to eat with the stew. The recipe comes from Jo Seagar’s book You shouldn’t have gone to so much trouble, darling. 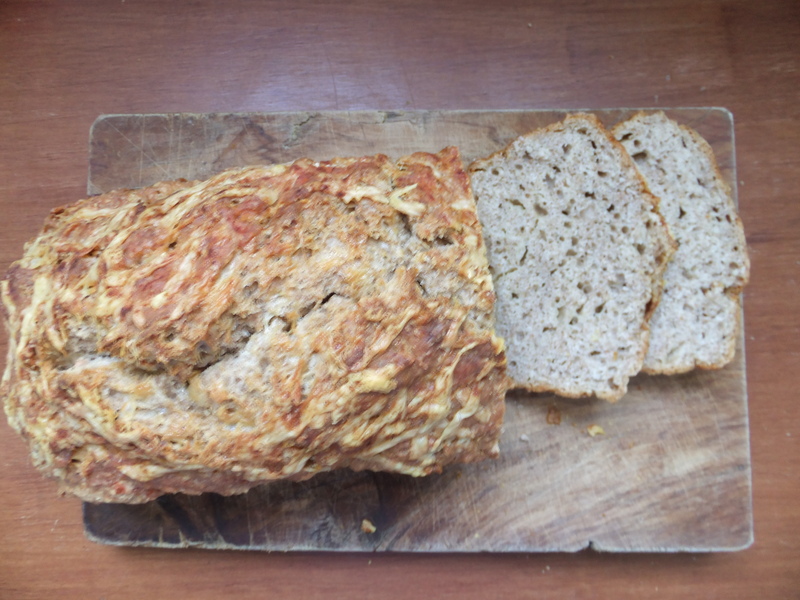 It is a wonderful quick bread with a lovely soft mealy flavour. The yeast in the beer acts as a rising agent, eliminating the kneading and time spent waiting for the dough to rise. The mixture can be in the pan, in the oven in less than 10 minutes. You could probably wipe the bench in this time too. The bread can be made with a variety of flours, or jazzed up slightly with a stuffing: fill the tin half with the dough then add a layer of onion jam, or spinach, or pitted olives, or roasted capsicums then top with the remaining mixture. On Sunday evening, after a long day working at Toast Martinborough, I made a toasted sandwich with sliced beer bread, some leftover beef from the casserole which I shredded with a fork and grated cheese. Perfect end to a busy weekend. Heat oven to 200°C. Quickly mix all ingredients together until just combined. 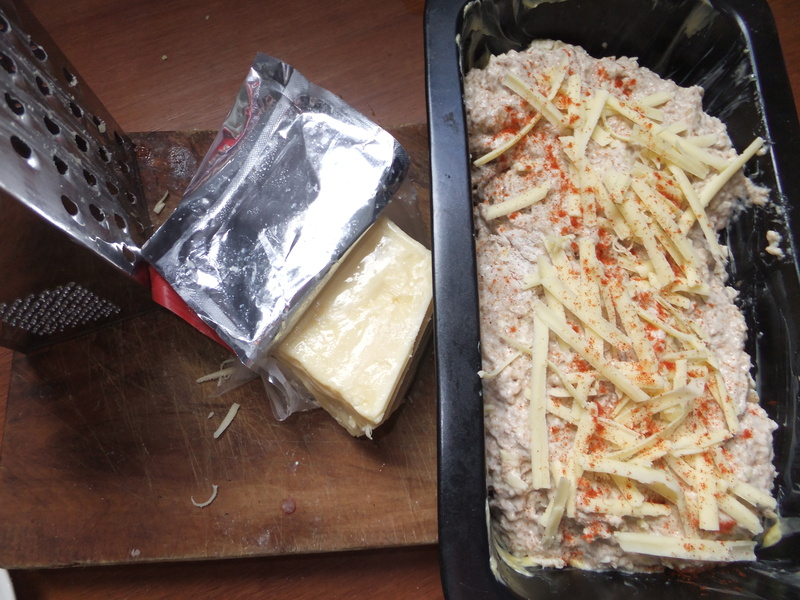 Sprinkle extra grated cheese on top and paprika. Or sea salt, or rosemary, or sesame seeds or poppy seeds. 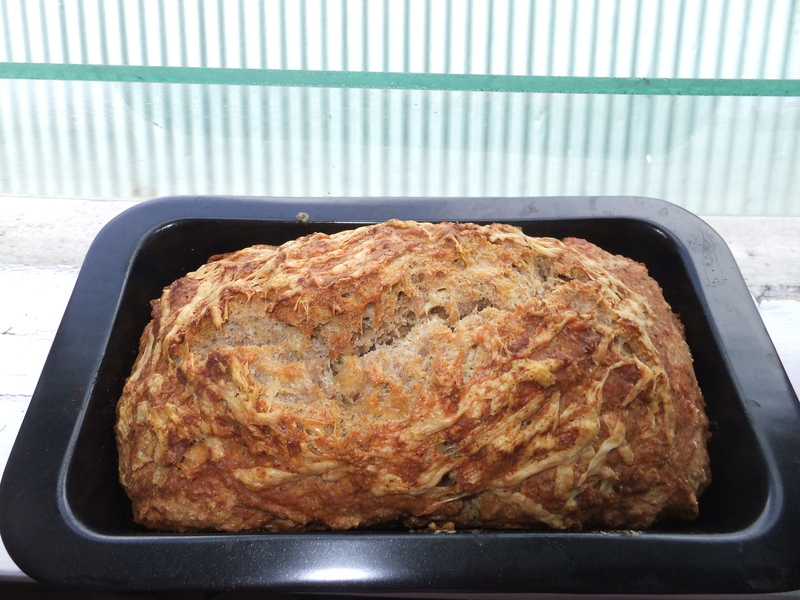 Place in a greased 10x20cm loaf tin for 1 hour. (If you use a 8x15cm tin bake for 35-40 minutes. I don’t feel I have ever given Italian food a real go. I like pizza and tiramisu as much as the next person but I have never been to Italy, nor a frequent eater at Italian restaurants and our cookbook collection is dominated by french cuisine. In spite of this I believe Italian food to be so much more than pizza and pasta, much like french food is so much more than baguette, snails and frogs legs. Maybe I am waiting for a life-changing trip to Italy where I can sample beautiful olive oils, baked aubergines with capers and tomatoes, or a fennel salad with Parmesan, or barbequed rabbit, and lemon and almond cake for dessert, or ricotta almond tart. The meatballs I made this week prompted this new found appreciation for Italian cuisine. They were light, perfectly moist and simply seasoned so what really came through was the almost creamy flavour of the mince rather than any garlic or herbs in the sauce. I almost feel like I’ve cheated… It has not taken the better part of 5 years of making and tasting every meatball I came across to achieve, what I consider, a pretty darn fine meatball. These meatballs I served with a tomato sauce and spaghetti but they would also be great atop mashed potatoes. Or make some of the mix into patties for a sandwich with tomato chutney and lettuce. The humble meatball really has given me a renewed enthusiasm for all things Italian. Place the bread in a small bowl and pour over enough milk to almost cover the bread. In a larger bowl place the beef mince, grated red onion, salt, pepper and egg – mix lightly. Refrigerate for several hours to allow the flavours to develop together. Use your hands to roll meatballs into bite sized balls. Heat a tablespoon of oil in a frypan and cook the meatballs in batches, stirring frequently, until cooked through. Keep cooked meatballs in a warm oven until ready to serve. Mix ingredients together in a saucepan, simmer to reduce. When I lived in France I didn’t really live the culinary dream many expected. I didn’t dine on foie gras or steak frites or cassoulet each day, drink a bottle of Bordeaux or Burgundy each night, and buy new cheeses and interesting cuts of meat from the market each week. I did most of my own cooking and would sometimes spend 3 days living on porridge, or bread and butter, or pumpkin soup for lunch and dinner. I rarely ate meat, mostly tofu, in fact I practically became a vegetarian. But there were wonderful meals during trips away to my friend’s auberge, or the confit du canard we treated ourselves to during a cold December weekend in Paris. There was Christmas in Wales with the most enormous turkey and a celebratory New Year’s dinner in Barcelona with Rioja and tomato bread and octopus. There were thick winter stews and a citrus, slightly tangy, cheese-cake strudel dessert at a tavern in Innsbruck, Austria. Then, towards the end of my travels around France I spent nearly a month living and working with two different French couples in the south-west region of France. For the first two weeks I lived on the outskirts of a small town south of Bordeaux called Pissos with Marie Hélène and Christoph. 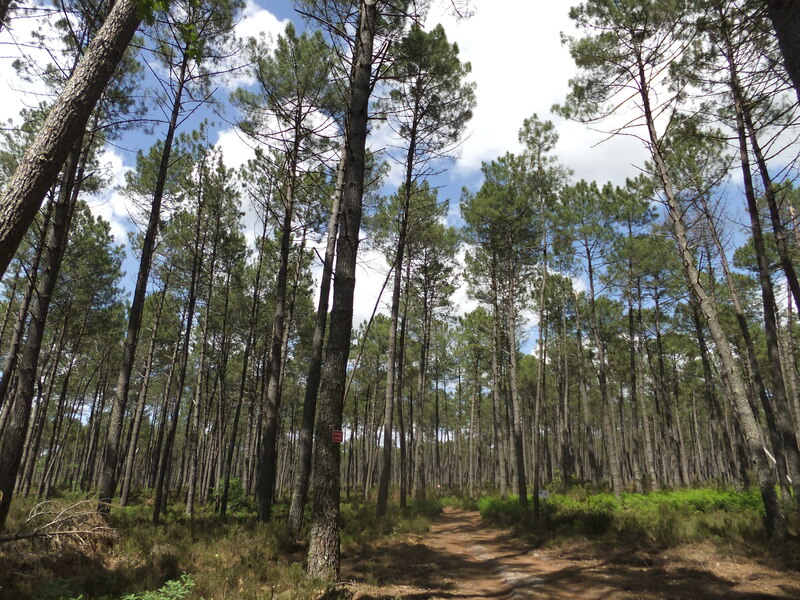 They live on pancake flat land surrounded by pine forest stretching to the horizons. They have a small river near their property where they catch trout, and make beignets from the blossom of elderflower trees hanging over the river banks. They have chickens and pigeons which cluck and coo all day, fly at the windows and have even been known to come inside the house. 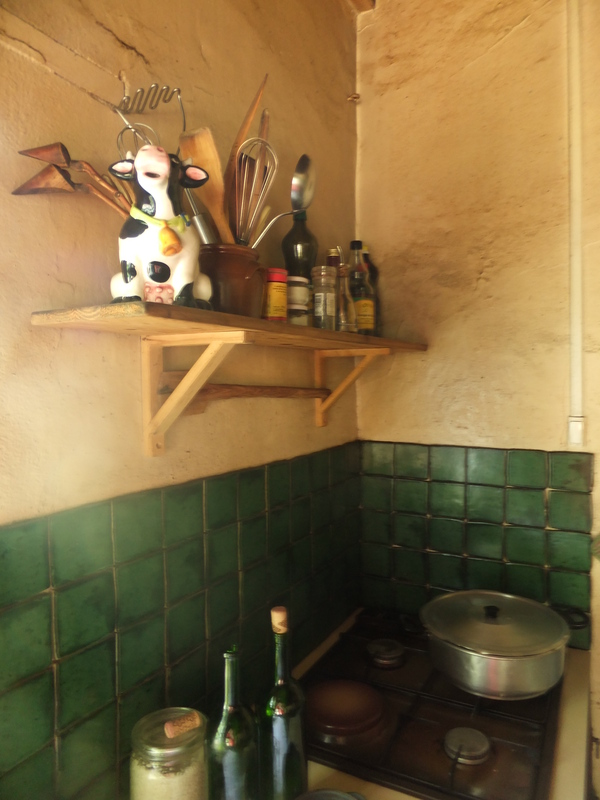 The kitchen is the centre of their home. It is an eclectic kitchen with benches of different surfaces and different heights, apothecary style jars sitting on shelves holding home-made herbal teas and their “pantry” is spread throughout the house in a beautiful collection of old chests and cupboards and sideboards. 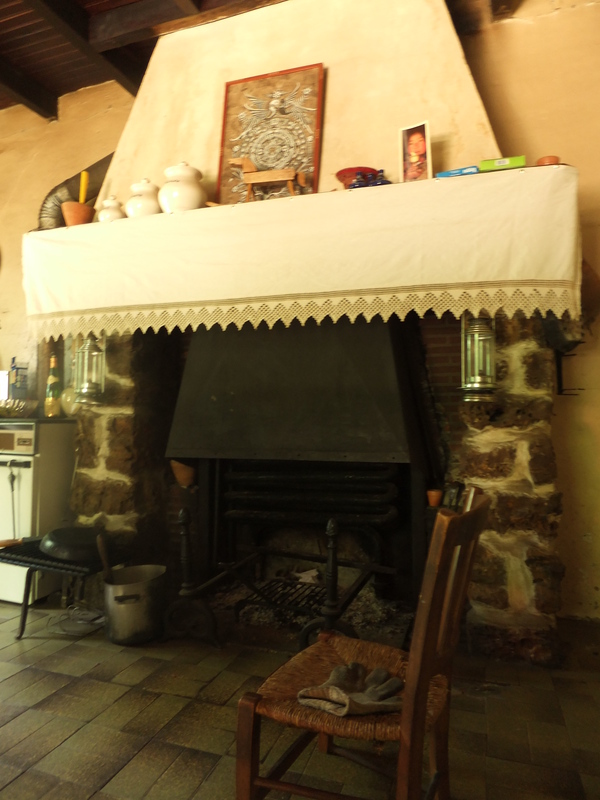 But the most impressive part of the kitchen, indeed the whole house, is the 180 year old fireplace. It is framed by a stone wall and has a white piece of lace fabric hanging around the top edges. It has a grill nestled in the bottom and a bar above the flames for hanging pots. I ate very well during my two weeks with Marie Hélène and Christoph; Marie is an amazing cook. I was helping Marie in her organic vegetable garden so everyday we had a an apéro hour of fresh radishes, or peas still in their pods, or baby carrots. We came home from the garden around 1 o’clock for lunch which was nearly always accompanied by a bottle of wine and fresh bread. One day lunch was a whole roast chicken (complete with innards and gizzards….) with home-made fries, another day it was fish baked in the outdoor fire, or roast pork and crispy sauteed new potatoes, or chunky andouillette sausages. Every meal was followed by coffee and, maybe yoghurt. The yoghurt was made in Germany and sold by Marie’s friend at the market; it was the smoothest, creamiest, most flavoursome yoghurt I think I have ever tasted. Every meal was memorable but one which I can most easily recreate here in my humble kitchen is the lentil salad. One day Marie Hélène rose early to cook a large pot of lentils. Before lunch she mixed through whatever she had on hand and fresh produce from her garden: tomatoes, feta, onions, chopped radish, garlic, fresh herbs and pieces of beautiful, sweet and slightly smoky cured Spanish style ham. We ate it outdoors in the sun at a table with a blue floral pattern cloth. 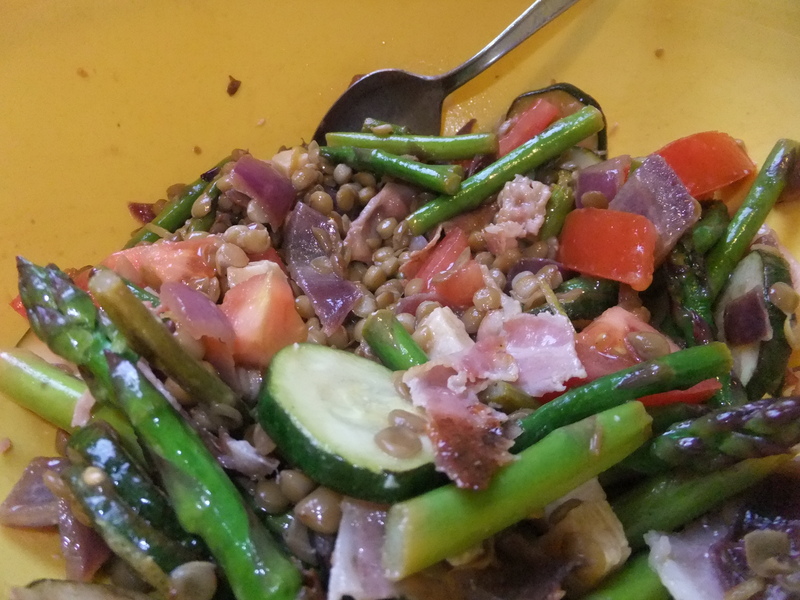 My lentil salad had a spring twist with asparagus and zucchini sauteed with lemon zest and juice and a pinch of chilli flakes. I used canned lentils and tossed through capers, diced tomato, cubes of Parmesan, though feta would have been nicer, small strips of bacon and slightly caramelised red onion. Shake a dressing together with olive oil, lemon juice, a crushed garlic clove, a teaspoon of mustard, salt and pepper. Then let the flavours mellow and soften together for a while. My lentil salad was more a topping to go with a leafy green salad but if I added one or two more cans of lentils this could have been a meal on its own. 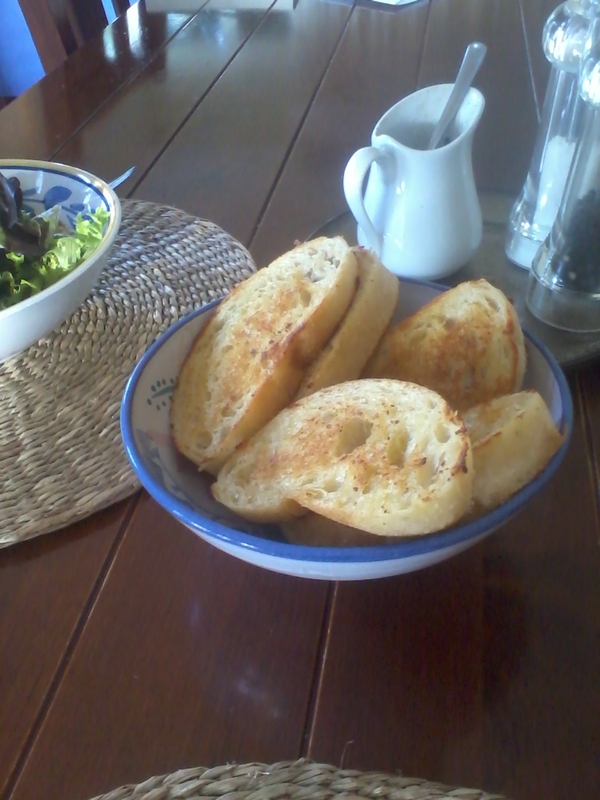 A torn piece of baguette or ciabatta drizzled in olive oil and lightly toasted would have been perfect with it. In the winter add cooked lentils to a warm roast vegetable salad with some spicy chorizo sausage; wonderful for eating seasonally. Summer is taking its own sweet time reaching us here in Wellington. I may not be able to recreate spring time in France sitting at an outdoor table surrounded by pine trees, blue skies and plentiful wine, but I do plan to coax summer forward with strawberries and Pimm’s and good, good salad.